I just love to look at recipes and sort out the flavor combinations in my mind...years of experience have helped me recognize a recipe that is poorly constructed. However, even I can be fooled. What really hurts, though, is to actually settle on trying something new...buy the ingredients, do all the work and have the dish fail the taste test. If faced with such a situation, a person could try to make some kind of last minute formula adjustment or...throw out the whole mess and pretend it never happened! Sometimes, however, a great recipe is just too complicated and fussy for my mood or energy level...and that is when I might want to fall back on the old and familiar...the tried and true...and sometimes boring. On the other hand, it could be just the right time to kick up the creativity factor and come up with a recipe that is wonderful! Today's recipe came about one day when I just could not resist buying a package of mild Italian sausage. I wanted to smell it cooking and listen to the fat popping in the pan...I wanted to savor the blend of the juicy meat and herbs...I craved SAUSAGE...but, I was also tired and did not want to put much effort into cooking that day. The flavors of what I wanted to taste ran around in my mind and as I pulled items from my shelves...the recipe just came together...it was a happy moment! Spaghetti cooked per pkg directions for 4 servings. Put sausage in a large pan and add enough water to come up half-way up the sides of the links; simmer on low, covered for 30-45 minutes. Drain off water. Turn up heat to medium. Brown links in a little margarine or olive oil, turning as necessary until wonderfully golden on all sides. Half way through the browning process, add onion and pepper slices along with the butter. Stir the vegetables as needed. Do not let the onions and peppers become overly browned or burned. When vegetables are tender and sausage is browned, add tomatoes, sauce and herbs to taste. Remove links to a cutting board and slice them on the diagonal, 1/2-inch thick. Add meat back to sauce. Turn down heat and simmer, partially covered until the tomato mixture is a thick sauce. 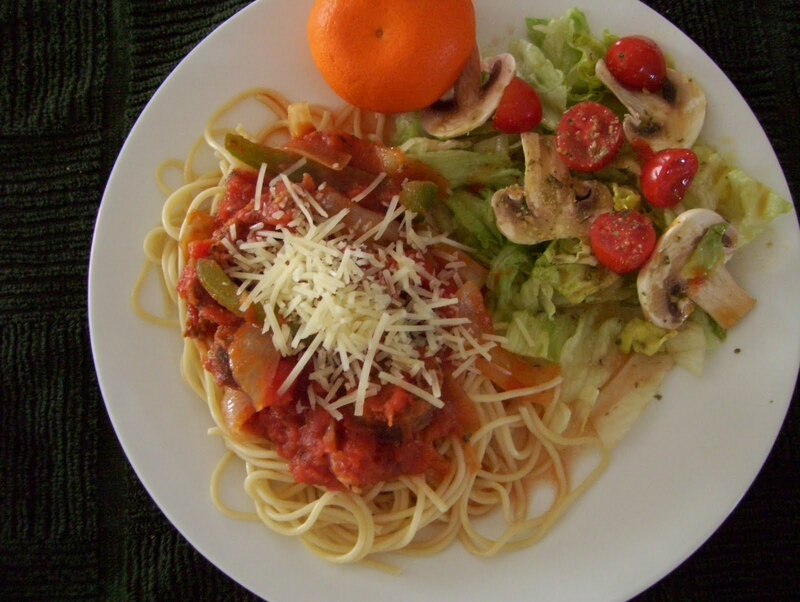 To serve: Place hot, drained spaghetti on plates and divide sausage slices among them. Ladle sauce on top of each serving. Sprinkle with freshly grated Parmesan cheese. Sides: Leafy, green salad; garlic bread; sliced apple.